Sooner or later, all technology goes the way of the World's Fair. Just ask Phillip Buehler, who in 1964 was a young amateur photographer stunned by the futuristic vision of society on display at the New York fair in Flushing Meadows. "When I was eight years old, I was amazed by all the technology -- the race to the moon, nuclear power, even Formica." But lately, Buehler's fascination has turned not on what is new and shiny in our society, but what is crumbling. The disposability of the recently modern in urban locations that were the ideals of industrial strength and innovation just three, four and five decades ago fascinates Web chroniclers like Buehler. His Modern Ruins site is devoted to America's grass-filled cracks in the pavement, from the World's Fair grounds in Queens to overgrown abandoned freight rail lines of the East Coast. His photography spans more than two decades -- from his trip by rowboat as a student to the decrepit Ellis Island in 1974, to his recent return visit at the behest of Parks Service officials who had found his Web site and thought he'd be interested in the scope of the immigration center's historic renovation. The blend of the modern Internet technology with images of urban decay and abandonment are striking, and Buehler attempts to lead his "visitors" through the industrial detritus. "I've tried to capture on film 'modern ruins,'" he says, "but walking through one is a 360-degree sensory experience. You're pricked with thorns as you make your way through into the overgrown ruin. Inside you feel the debris crunching beneath your feet and hear the echoes of your footsteps. The air inside a ruin is cool and damp and smells musty. And you can imagine the last inhabitants. They're quite soulful places." Particularly striking (perhaps because it's not as famous as the World's Fair and Ellis Island) is the hulk of an old Alcoa factory in New Jersey near the Hudson River. Contaminated by toxic chemicals known as PCB's (polychlorinated biphenyl), it remains unused despite a prime location on the waterfront. Cleaned out only a few years ago in an attempt to put in condominiums, the old plant nonetheless is being quickly reclaimed by a process with no respect for the industrial age. Buehler's photographs show soaring empty space, missing floors, and chemical stalactites on the support columns. In Detroit, Lowell Forest Boileau shares the fascination with urban ruins and like Buehler, he has taken his vision to the Web. The Fabulous Ruins of Detroit captures what's left of the Motor City's golden age earlier this century. "I did this site from the heart," says Boileau, a painter based in the city. "Over the years, I have painted a number of these settings and have had a long interest in their symbolism of the transformation of the industrial age to the information age. As such I have enjoyed a spectacular front row seat here in Detroit." Detroit's shining Renaissance Center rises above the ruins of the city's industrial beginnings. The site is filled with the physical decline of a society built on what was once a new and exciting technology -- like a glimpse at Palo Alto or Seattle in the 2040s. From the crumbling late 19th century mansions of the Brush Park neighborhood near the city's downtown, to the "factory that changed the world," Henry Ford's Model T plant, still in partial use as a warehouse, there is a definite sense -- conveyed along the circuits of the hottest technology of the moment -- that the term "modern technology" should always be viewed in a wider context. The buildings' "pathetic decline, in comparison to the reverence with which ruins are worshipped in other places in the world, provides a picture of the attitudes of our times as well as providing the ironic twist so useful in artistic expression," says Boileau, who shies away from the tag of preservationist. "Many of them are, to me, glaring symbols of corporate greed whose abandonment has humbled a once great city and hinders its comeback. What really attracts me is their visual presence and immensity. They are simply awesome in their deliquescence and the artist inside me stands agape before them." As is always the case with the Web, however, these digital monuments to the urban past don't stand isolated like the buildings they portray. Thousands of people visit, and they react. Most often, it's people who know the settings well -- World's Fair visitors, former factory workers, people who grew up in the shadow of the buildings in different eras. Boileau, who receives many notes from former Detroit residents, got this one recently from a Web surfer who was entranced with the site: "I returned to my hometown a few years ago after having been gone for 15 years. 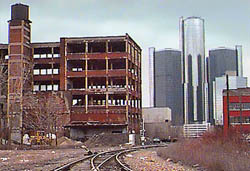 Retracing my Detroit roots proved Thomas Wolfe's axiom that you can't go home again. In this case this is because home is no longer there." Jason Chervokas & Tom Watson at nation@nytimes.com welcome your comments and suggestions.